My dad just received his 100% disability from the US Navy. So he brought us here for a vacation. My brother, Ricky, has Downs Syndrome and I have been his caregiver since my mom passed away in 2007. Ricky loved everything, especially the hot tub. For our family vacation the weather was hot. We had on storm while here. We enjoyed the fields in the wood and visiting the Cherokee reservation. The train ride was fun. We visited Gatlinburg too -- exploring and relaxing. On our drive towards Murphy we stopped at Rib Country Drive In. Bryson City had great food, but we did most of the cooking here. Everything was great. Love the area. You have a beautiful cabin and the decorations fit perfectly. It was so peaceful and relaxing. Thank you for sharing your place with us. The ladies at the rental office are wonderful as well. Very accommodating and always making sure the stay was satisfactory. Great job, ladies!! We all enjoyed the stay, but mostly Ricky. May god bless you and protect your family. We came up after our daughter's high school graduation. We enjoyed hiking, zip lining, horseback riding, white water rafting, Gatlinburg, Ripley's Aquarium, and tubing at Deep Creek. The best part was spending time as a family and enjoying the beautiful cabin!!! Thank you. Best friends meeting up with our kids! We went hiking, saw "Unto These Hills" and enjoyed shopping in Cherokee. Having family / friend time was great. The stars at night are incredible! Beautiful cabin!! Very clean and peaceful. Overall, loved our stay and the cabin. Beautifully decorated and clean. Friendly. and we REALLY appreciated the 10% Military Discount. We had our Marine and his wife with us and it just made it all the more special to have that appreciation. Very nice. Cool nights were perfect for the campfire and smores. We made them with Reeses peanut butter cups. We toured Bryson City and enjoyed the waterfalls and train ride. Most important was very needed family time. Drove to the top of the mountain. Beautifully decorated and clean. We really appreciated our stay -00 second time on Baines' Mountain, and I'm sure we'll be back. Directions were perfect. Definitely want to take their advice and find the property in the daytime as the roads are really dark. We went hiking around the cabin and at Deep Creek, saw the Fontana Dam, mined for Gems at the Nantahala Gem Mine, took a ride on the Great Smoky Mountain Railroad and went to Asheville for a day to zip line (younger kids weren't heavy enough for the local zip line). We hiked at Deep Creek, mined for gems at Nantahala Gem Mine, zip lined in Asheville, and rode the Great Smoky Mountains Railroad in Bryson City. We had a self-guided tour of Fontana Dam. We loved the hiking trails - great waterfall. We loved Tupelo's Honey in Asheville for dnner. We didn't get to go white water rafting, but it sounds wonderful. Seeing "smoke" over the Smokies in the morning on the curvy roads on the way to the cabin was great. We saw deer at Deep Creek and snapped the perfect picture. Beds were extremely comfortable!! Well decorated cabin. Beautiful nice table for family dining. Thank you for letting us stay in your beautiful cabin. We would love to return! We surprised Jessica for her birthday. We went to the casino. We had such a ball! I definitely recommend the casino. We truly enjoyed you weekend. We relaxed and had a great time. We needed a weekend away. It was impressed with the cabin. Absolutely beautiful. We had an amazing time. I had never been to North Carolina, I feel in love with the mountains and rivers and all. We all had a great time. This cabin is beautiful don't want to leave. Thank you for sharing your beautiful cabin with us. Makes me want to have one just like this. I also thank God for my super kind hearted boy friend who spoiled the kids and I here on this trip. Really enjoyed Sunrise Ridge. Beautiful place in the mountains. Thanks so much for having us. Amazing cabin. Everything we could want plus more. Even had the little things we forgot like sugar for our coffee. We were supposed to stay at a different cabin but the hot tub was struck by lightning & the cabin rental agency was so nice to offer this property instead. We tried to check-out the original property but couldn't make it up the drive. Seems like the paved driveway is fairly new from the other comments & definitely a plus. So glad we got to enjoy the hot tub. Too rainy to try-out the fire pit. guess we'll just have to come back. Can't wait to come back. Amazing cabin. Everything we could want plus more. Even had the little things we forgot like sugar for our coffee. 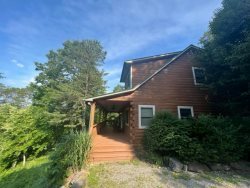 We were supposed to stay at a different cabin but the hot tub was struck by lightning & the cabin rental ageency was so nice to offer this property instead. We tried to check-out the original property but couldn't make it up the drive. Seems like the paved driveway is fairly new from the other comments & definitely a plus. So glad we got to enjoy the hot tub. Too rainy to try-out the firepit. guess we'll just have to come back. Can't wait. We had an awesome time at Sunrise Ridge. Thanks so much for sharing your beautiful cabin with us. This is one of the best spots we have stayed throughout the Bryson City area. The cabin is beautiful, love the hot tub, fire pit is awesome, grassy area for the kids to run around is hard to find. the X-box was a plus, would have been great to have a 2nd TV for the adults to watch while they were playing. But, we have zero complaints, the best place we have stayed. Very clean and well equipped with everything needed. We will definitely plan another trip next year.